THE former Dollar Academy flanker John Barclay has been around the block a few times since he first announced his arrival on the international stage with a very promising rearguard performance for the Scotland “subbies” against Richie McCaw’s All Blacks in RWC’07. Back then he was the next big thing, the uncapped newbie in the squad out to make a name for himself. Eight years on from that day and still just 28 years old, Barclay is in danger of becoming yesterday’s man having not started a Test since November, 2013. The flanker probably has no more than 60 minutes on Saturday to argue his case. Vern Cotter declared that the back row was the single most competitive area within the Scotland squad and the coach wasn’t joking. Somehow he must cull a total of ten breakaways (including Rob Harley, listed as a lock) down to no more than six. There are four specialist sevens in the mix, three of whom, Blair Cowan, Hugh Blake and John Hardie are Kiwis who may well speak the same lingo as their coach on the field as well as off it. All four of them are fighting for one or, at most, two spots. If tomorrow’s return fixture against the Azzurri does prove to be the Scot’s international swansong the cerebral openside at least appears at one with the world. “I was really enjoying my rugby where I was [in Wales] and felt I was playing well,” says the bearded Barclay, “so I think over the year I realised you can only do what you can do and if you don’t get picked you don’t get picked. It took me a while to realise that. As the months wore on I accepted that I can just do what I can do. I guess it worked in the end. 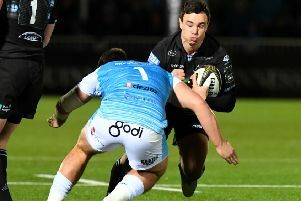 “It was already competitive and another back rower [Hardie] comes in but I genuinely had the mindset that how he plays has no impact on how I play. I can play as well as I can play and he is a different player to me, he does different things, he had different qualities, so ultimately it’s what Vern [Cotter] wants and he’ll decide. I’m not saying I won’t be disappointed, of course I’ll be really disappointed if I don’t get picked, but if I play as well as I can and I still don’t get picked what can I do? I can’t change that. Of course I’ll be gutted if I’m not involved but I have enough understanding now to know that if you put your best foot forward and you still don’t get picked then that is out of your control. Barclay has had the good fortune to contest two World Cups already which is more than some can claim. He expresses sympathy for his former back row buddy Johnnie Beattie who looks like missing out on the big one altogether and he explains that his best mate Graeme Morrison was devastated when he missed the cut back in 2007. That was the first time that Scotland had failed to reach the quarter-finals after losing, in agonising circumstances, to Argentina and then falling short against England, although it wasn’t for the want of effort. Whatever team Cotter fields will obviously give it a blast because the Kiwi coach has always asked his teams to express themselves with the ball in hand, which may not suit Barclay’s style since he has been labelled a “defensive” player, less willing or able to act as a link and bring some dynamism to the attack. There is some truth to the charge, although you could argue that by discarding Hamish Watson the coaches have ignored the most dynamic flanker of the lot. The point is that World Cup ties between two evenly-matched teams, for example Scotland and Samoa, are usually close, nervy affairs in which one mistake can cost the game. The last time they met, Alex Tuilagi ran over the top of Tom Heathcote to score a try and Samoa went on to record their first ever win over Scotland. Being tagged the “defensive seven” in a World Cup year may not be quite the handicap that some imagine. “At the Scarlets we felt that he was playing in two positions,” said Cotter when quizzed about his veteran seven. Barclay will be starting for sure, the question remains whether the Italy match also proves to be the end of a promising international career? Stuart McInally (Edinburgh), Gordon Reid (Glasgow), Jon Welsh (Glasgow), Robert Harley (Glasgow), Blair Cowan (London Irish), Henry Pyrgos (Glasgow), Ruaridh Jackson (Wasps), Matt Scott (Edinburgh).